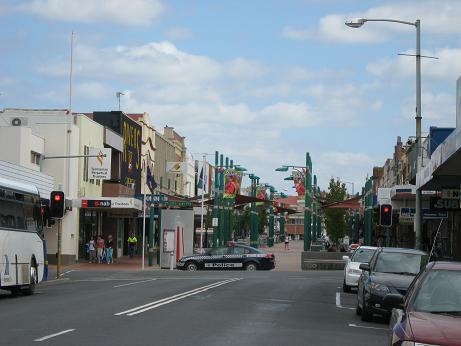 Devonport is Tasmania's third largest city, with a population of 25,000. It is situated on the banks of the Mersey River, in the centre of a fertile valley. It is no surprise then that the region is referred to as "Australia's Market Garden", producing 40% of the vegetable crop of Tasmania. Vegetables grown include onions, potatoes, peas, carrots and beans. 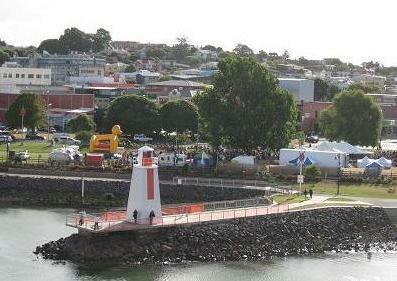 The city is well-known for being the home port to the Spirit of Tasmania vessels. In fact the first time I saw Devonport, I was coming to the close of a memorable trip on the Spirit of Tasmania I. I still remember the wonderful views of the city as the ship arrived ever closer. It was a terrific way to arrive in Tasmania. Cycling/walking is a great way to get to know the city. There are over 20 km of bicycle paths/walkways. I enjoyed walking through the parklands along the waterfront. To start with, you should go to the Visitor Centre where you can get information, maps and brochures. The City Walk begins in the city centre and follows the river foreshore. 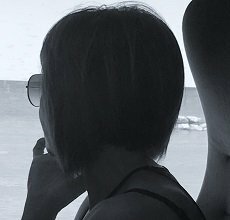 Along the way, there are delightful sculptures and the viewing platform from which you can watch boats and ships passing by. You will also get to see the Lighthouse and a blowhole. The entire walk is about 9km long - follow it for just part of the way if you wish. Keen on Tasmanian Aboriginal history? At the Tiagarra Aboriginal Centre you can learn about the life of tribal Tasmanian Aborigines. You can also wander the Mersey Bluff headlands and view aboriginal rock engravings. How about more recent history? Then visit Home Hill, built in 1916 and run by the National Trust. There you can learn about the family life of Joseph Lyons and Dame Enid Lyons, Tasmania's only Prime Minister (so far) and his wife. Are you a train enthusiast? At the Don River Railway, Tasmania's unique Railway Museum, you will find Tasmania's largest collection of steam locomotive and passenger carriages. There is even a vintage train which runs 6 days during the week, and with steam on Sundays and holidays. I came across these two splendid federation buildings. I discovered that they are the Old Courthouse (which opened in 1903) and the Town Hall (built in 1899). 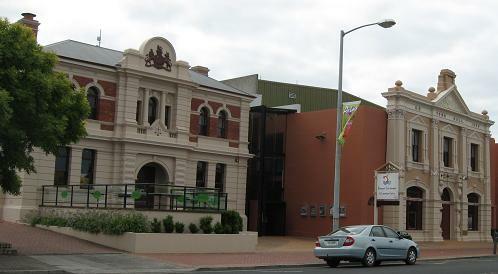 They now house the Devonport Entertainment & Convention Centre. Like most modern cities, there is a central shopping mall. Notice the police car in the photo? A few minutes prior to taking this photo, I was at the Visitor Centre and overhead a passer-by reporting to staff that a man was harrassing shoppers at the Rooke St Mall. After taking the photo I watched as officers left the parked police car and went to talk to a man who was shouting at people walking past. Impressive response time! 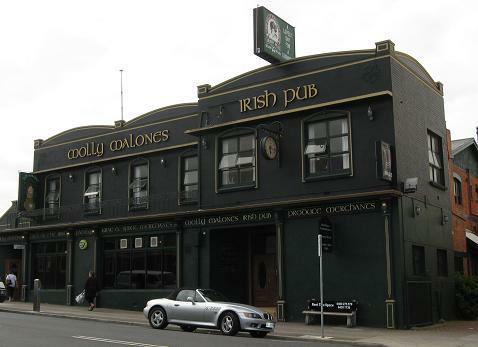 Molly Malones Irish pub is a popular spot for beer on tap in town. You can get a meal here too and in cooler weather, enjoy the warm fireplace inside. Backpacker accommodation is also available. 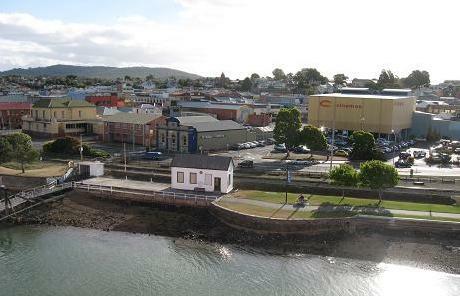 Make sure to spend some time in Devonport, especially if you are traveling on the Spirit of Tasmania.